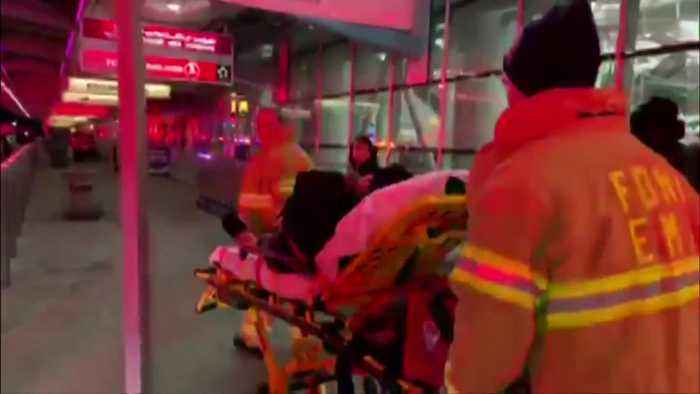 More than two dozen people were injured and at least 10 were taken to a hospital after a Turkish Airlines flight encountered severe turbulence on its approach to New York's John F.
Kennedy International Airport on Saturday, officials said. ROUGH CUT (NO REPORTER NARRATION) More than two dozen people were injured and at least 10 were taken to a hospital after a Turkish Airlines flight encountered severe turbulence on its approach to New York's John F.
The New York Fire Department said it was treating 29 passengers for "non-life-threatening injuries" at the airport, after having initially reported the number on Twitter at 32. Most of the injuries aboard Turkish Airlines Flight 001 from Istanbul were minor, according to Steve Coleman, spokesman for the Port Authority of New York and New Jersey, which operates JFK Airport. "The majority of them were bumps, bruises and cuts," he said. "I'm not aware of any life-threatening injuries at this point." The 10 passengers sent to a local hospital included a child and one with a possible broken leg, he said. The airliner, carrying 326 passengers with a crew of 21, ran into "severe turbulence" about 45 minutes before landing at 5:35 p.m.
EST (1035 GMT), Coleman said. Turkish Airlines said 28 passengers and two cabin crew were slightly injured due to "unforeseeable weather conditions", 18 of the 28 passengers were taken to a hospital, and 10 of them remained under medical observation as a precaution. "We keep closely monitoring the health status of these passengers and our team," the airline said in a statement. The National Weather Service's Aviation Weather Center had issued an advisory for severe turbulence over New England on Saturday evening. It was the second incident at a major New York-area airport on Saturday. New Jersey's Newark airport closed its runways earlier in the day after a cargo plane flying to Florida from Canada was forced to make an emergency landing.